In certain situations you will be unable to access UD resources off-campus, such as Gmail and Amazon Cloud, using the standard VPN procedures. For example, if you are traveling to a particular country that blocks certains kinds of network traffic you will need to use VPN full-tunnel to access certain UD systems and resources. In order to satisfy the increased security requirements of full-tunnel, you will be required to use two-factor authentication (2FA) to use this connection. Your 2FA account must be set up prior to using full-tunnel. Follow the basic directions for using AnyConnect on your computer or mobile device. However, be aware that you will need to select a different Group and provide a second "password." 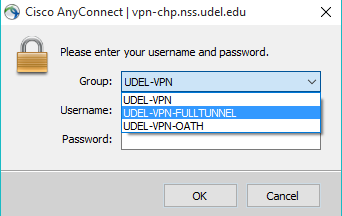 On the login dialog box, use the Group menu to select the UDEL-VPN-FULLTUNNEL group. 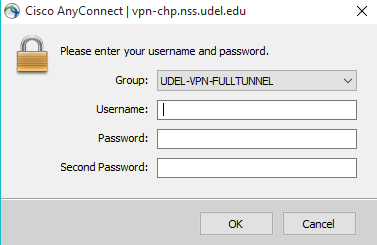 Once you are connected you can verify that you are using full-tunnel by going to www.udel.edu/ip to verify your Internal UD IP address (10.7.a.b) and any number of off-campus sites like http:www.whatismyip.com to verify your full-tunnel external UD IP address (128.175.x.y), when connected to the full-tunnel VPN service. Test your ability to access the full-tunnel VPN so you can troubleshoot any problems before traveling to another country. Departmental IT staff should review the new section of the administrator's page about the public range to which full-tunnel VPN addresses map. Any special access that you are granted with standard VPN will still apply when using VPN full-tunnel. Because of the limited number of available full-tunnel users, the VPN full-tunnel connections will timeout and close approximately 10 minutes after the last active session ends. Before connecting, click the gear icon. 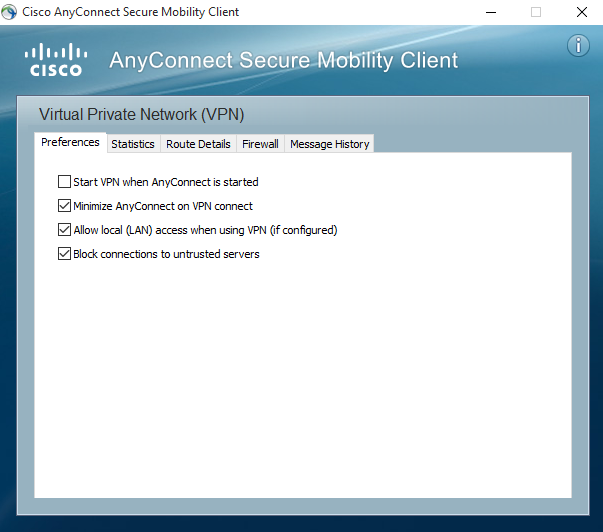 In the new dialogue box, select the Preferences tab and check Allow local (LAN) access when using VPN (if configured).